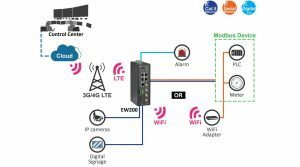 EtherWAN Systems Inc., has announced the launch of two new models of industrial cellular gateway: the EW50 and EW200. With just a standard SIM card and a cellular subscription, these devices can interconnect Ethernet, serial, Digital I/O and Modbus protocols, bringing together diverse field assets for critical applications. The addition of these new models will allow EtherWAN to deliver a more complete solution, and are anticipated to unlock more vertical integration market opportunities. Both devices enhance application design flexibility, while offering more topology option. They are ideal for M2M (Machine to Machine) and IIoT (Industrial Internet of Things) applications, including transportation and smart grid. Network security is now more important than ever before. The EW50 and EW200 both provide secure VPN remote connectivity using Ethernet, Wi-Fi and Cellular IPSec, OpenVPN, PPTP, and L2TP VPN, with support for up to 16 concurrent tunnels with 70~100Mbps throughput. Additionally, SPI (Stateful Packet Inspection) and IPS (Intrusion Prevention System)firewalls provide added protection against network intrusions. Dual SIM card slots in a single module provide a special fail-over mechanism. If the cellular connection for the SIM card currently in use is lost, the device will automatically switch over to the other card. This greatly reduces network downtime. Support for VRRP (Virtual Router Redundancy Protocol) further enhances availability and reliability of the communications between remote devices. Because these gateways are designed to handle mission-critical applications, the Event Engine and Event Handling systems are of paramount importance. Notifications can be sent by e-mail or SMS, and managing/notification events include: DI, DO, Modbus, SMS, Syslog, SNMP Trap, e-mail Alert, and reboot. These cellular gateways and designed and manufactured to industrial environmental standards, and can operate stably at temperatures from -30 to 70°C (-22 to 158°F). Redundant 12V-48V DC power inputs provide seamless power failover in case one power source is lost.